Here are six examples of events and interactions. We recommend that you follow along the steps in the exercises below to complete them. Add “Link To” events to navigate to other screens in your prototype and make your prototype interactive. In this exercise, we’ll learn how to create “Link To” events. In a new prototype, drag a Text widget and a Button widget onto the Canvas. Label the Text “Screen 1”, and the Button “Go to Screen 2”. 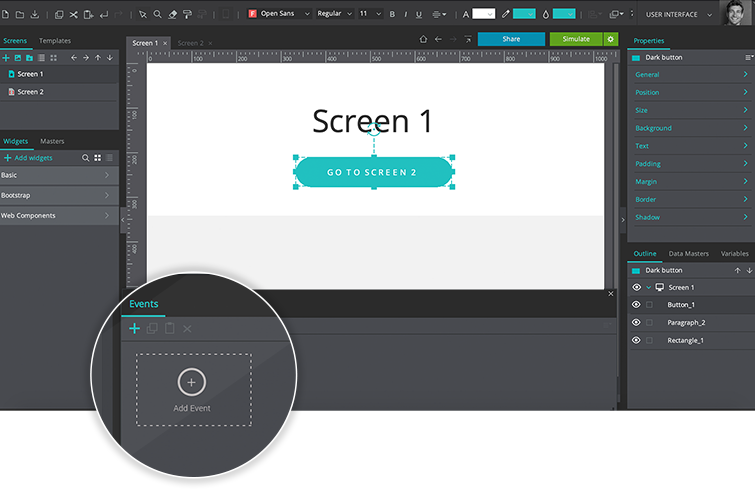 Create a new screen by clicking the ‘+’ icon in the Screens palette. Name this screen “Screen 2”. On this screen (Screen 2), drag a Text widget and a Button widget onto the Canvas. Label this Text element “Screen 2” and the Button “Go to Screen 1”. Go back to Screen 1, and select the Button by clicking on it on the Canvas, or by selecting it in the Outline palette. Look to the Events palette at the bottom of the screen. Click on the “Add event” button. 4. Click “OK” to finish building the event. You can view the event you have just created by looking to the Events palette. Now click “Simulate” and click on the button on Screen 1. You’ll then be linked to Screen 2. Repeat steps four through six on Screen 2, creating an “On Click” + “Link To” event for the “Link to Screen 1” button, choosing Screen 1 as the target to be linked to. Another way of creating “On Click” + “Link To” events is by dragging an element to a Screen in the Screens palette. Additionally, you can right-click on an element to create the “On Click” + “Link To” event. Next, we’ll learn how to use the Events palette to create events to show and hide UI elements on the screen. In a new prototype, drag two Button widgets and an Image widget onto the Canvas. In our example, we’re using an icon from the Mobile Wireframing widget library as the Image. Label one Button “Hide icon” and the other Button “Show icon”. 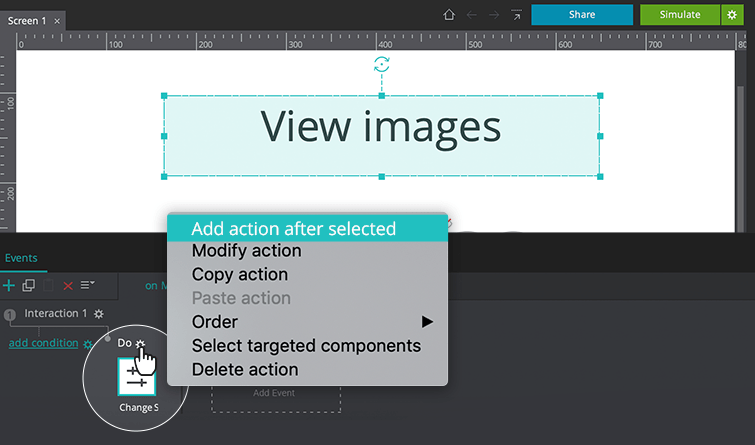 Mark the Image element as hidden by selecting it on the Canvas or in the Outline palette, and then going to the Properties palette and ticking “Hide component”. Now, when simulating, this Image will not appear on the screen. Select the “Hide icon” button and click on “Add Event” in the Events palette. Now select the “Show icon” button and click on “Add Event” in the Events palette. Note: if you are using a Web prototype, all “On Tap” triggers will be listed as “On Click”. Click “Simulate”. When you click on the “Show icon” button, the Image will appear, and if you click on the “Hide icon” button, the Image will disappear again. In our third exercise, we’ll learn how to change the style of content when we mouse over it. 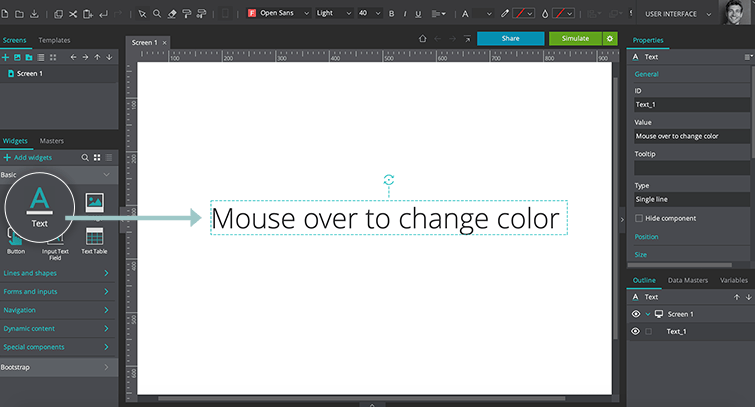 In a new Web prototype, drag a Text widget onto the Canvas and label it “Mouse over to change color”. Click “Simulate” and mouse over the text. It will change to the color you’ve defined. When your mouse leaves the text, it will revert back to its default color. Create a new Web prototype. 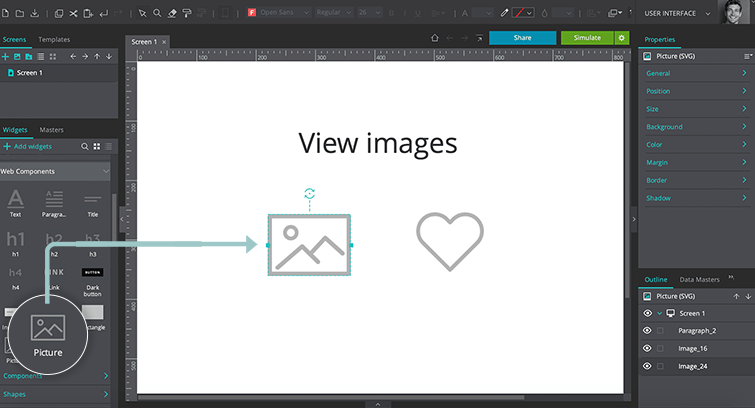 Drag a Text widget and two Image widgets onto the Canvas. 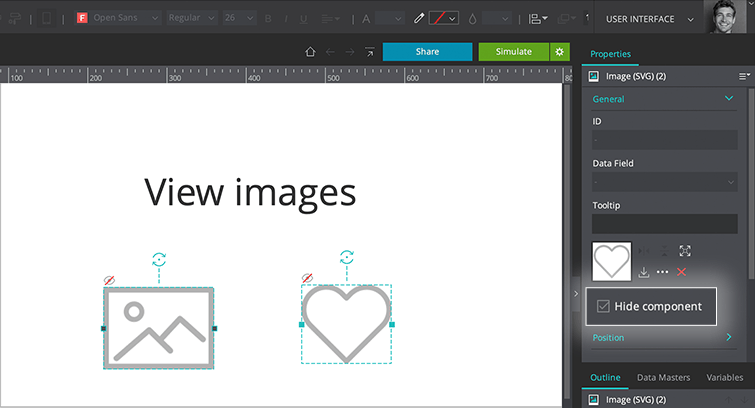 In our example, we use icons from the Web Wireframing widget library as the images. Label the Text widget “View images”. Select both of the icons on the Canvas by Control-clicking (or Command-clicking if on Mac). 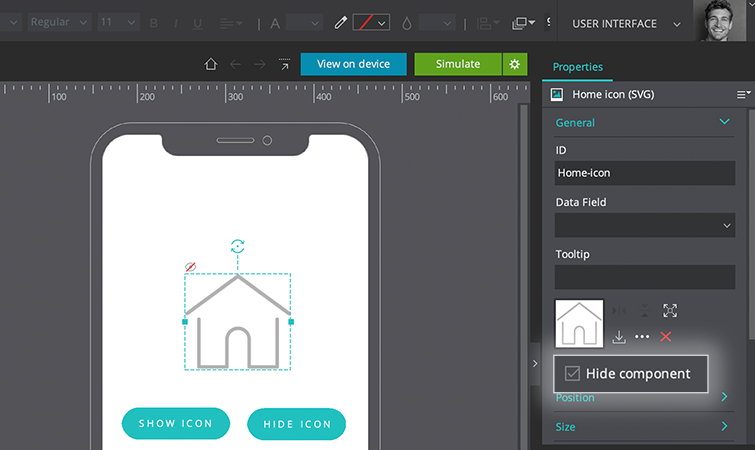 Then, mark them as hidden by ticking the ‘Hide component’ box in the Properties palette. Now, when simulating, these icons will not appear on the screen. With the Text element selected, look to the Events palette, where you’ll find the event you just created. Click on the action and a blue border will appear around it. Then, click on the ‘gear’ icon and a dialog will appear. Select ‘add action after selected’. 3. For the target of action, Control-click (or Command-click if on Mac) the two icons in the Events Dialog Canvas. Back on the Events palette, you’ll find the actions you just created. Now, there will be an ‘arrow’ icon between the actions. Click on the arrow, and a dialog will appear. Select ‘WITH’ previous. Both actions will now execute at the same time. Click “Simulate”. When you mouse over the text, it will change color and become underlined, and the two icons will appear. When your mouse leaves the text, it will revert back to its original color and decoration, and the icons will disappear. 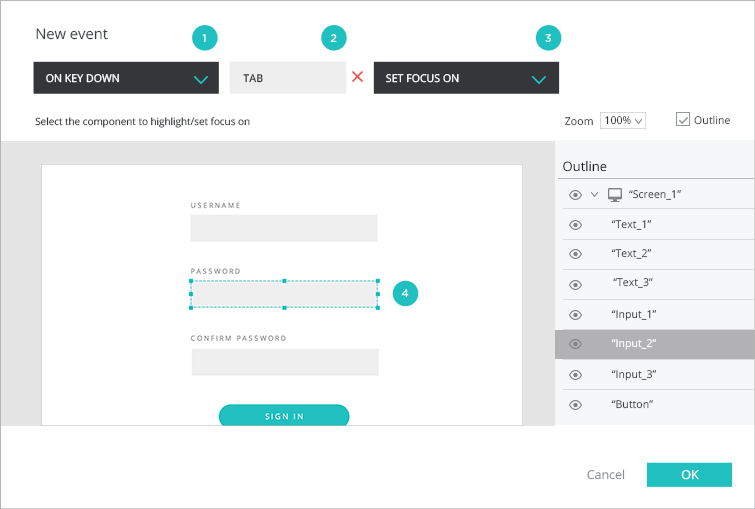 In forms with multiple input fields, users often tab (jump) between fields using the “TAB” key on their keyboard. Design an input form by dragging Text and Input Text Field widgets to the Canvas. To reproduce our example, create “Username”, “Password” and “Confirm Password” fields. Select the “Username” Input Text Field and go to the Events palette. Click the “Add event” button. Click “Simulate” and enter the “TAB” key. The cursor should jump from the “Username” Input Text Field to the “Password” Input Text Field, and then from the “Password” Input Text Field to the “Confirm Password” Input Text Field once pressing “TAB” again. In a new prototype, drag two Text widgets, two Input Text Field widgets and an Image widget onto the Canvas. Label one Text element “Add values” and the other “Result”. For the Image element, upload a ‘+’ icon, or use one of the pre-made ‘+’ icons found in the iOS Icons widget library. 7. Lastly, drag the other Input Text Field into the open space that just appeared next to the ‘+’ icon. Click “Simulate” and enter in a number in each Input Text Field element, and then click on the ‘+’ icon. The sum of those values will appear in the “Result” text.